Spring is here! Come play at The Lawn on D – now open for the season. Enjoy the area, play a game, grab a swing and more. Open today 7 a.m. to 10 p.m., The Lawn on D, 420 D St., Boston. Beatles fans you don’t want to miss this event.Live bands from UMass Boston will be performing Beatles’ covers an reinterpretations, as well as original songs inspired by the Fab Four. This is a free event. 7:30-9:30 p.m., UMass Boston Performing Arts, 100 Morrissey Blvd., Boston. After work head on over to the Boston Young Professionals Association’s After 5 Social, this month at the Back Bay Social Club. Enjoy complimentary appetizers while you mix and mingle. Tickets are $15 in advance (free for members). 6-8 p.m., Back Bay Social Club, 867 Boylston St., Boston. Learn about the pilot beer of the night from the Harpoon brewer who brew it and give your feedback at tonight’s Harpoon X-Night. Each month Harpoons hosts these pilot beer events to celebrate them and see what you think. This month, Harpoon is hosting their friends from Blake Hill Preserves Kitchen. Blake Hill, located in Artisan Village in Windsor VT to sample their products for you. Tickets are $20. 7:30-9:30 p.m., Harpoon Brewery, 306 Northern Ave., Boston. A brand new production of the “The Sound of Music” arrives at the Boch Center Wang Theatre May 1-13. The beloved musical story of Maria and the Von Trapp Family features the Tony, Grammy and Award-Winning Best Score. Tickets start at $35. 7 p.m., Boch Center Wang Theatre, 270 Tremont St., Boston. Moms, grab your pals and head out to the Ultimate Moms Night Out event. Mingle, unwind, eat some amazing food, drink some wine or mocktails, enjoy some pampering and more. Tickets are $25. 6:30-9:30 p.m., Arts at the Armory, 191 Highland Ave., Somerville. Celebration its 40th year, the Big Apple Circus is at Assembly Row in Somerville throughout school vacation week. Tickets start at $19. 7 p.m., Assembly Row, 355 Artisan Way, Somerville. The Lawn on D plays host to a Steven Spielberg/John Williams movie series with this 1977 science fiction classic. 8 p.m., The Lawn on D. 420 D St., Boston. The Copley Square Farmers Market opens for the season today. Tuesdays and Fridays 11 a.m. to 8 p.m. The market is located along 139 St. James Ave., Dartmouth Street and Boylston Street, Boston. Grab the family for a performance of “Stuart Little” tonight at the Wheelock Family Theatre. E.B. White’s classic tale follows Stuart, a mouse born into a New York family, and his many "larger than life" adventures. Tickets are $20-$38. 7:30 p.m., Wheelock Family Theatre, 180 Riverway, Boston. If you’re serious about BBQ and Samuel Adams beer, you don’t want to miss the 4th Annual ACBW Pig Roast at the Samuel Adams Boston Brewery. The event kicks off American Craft Beer Week and your ticket includes a full BBQ dinner (there is a vegetarian option available), two different bluegrass bands and six, 7 oz beer samples. Tickets are $30-$55. 6-9 p.m., Samuel Adams Boston Brewery, 30 Germania St., Boston. Head out on Boston Harbor tonight for a 90’s themed boat cruise. Wear you’re most creative outfit from that decade and enjoy a night of dancing and more on the open water. This is a 21+ event. Tickets are $20-$25. Boarding is at 6 p.m. sharp, boat leaves dock at 7 p.m. and returns at 10 p.m.. 200 Seaport Blvd., Boston. The youngest Franklin Park Zoo gorilla, Azize, turns 3 this month and everyone is invited to the party. Enjoy zookeeper chats, a visit with Curious George and more. 10 a.m. to 2 p.m., Franklin Park Zoo, 1 Franklin Park Road, Boston. Chocolate lovers, you are going to love this. Join Cocoa Beantown for a Saturday morning chocolate tour through Back Bay or an afternoon tour in the South End. Learn about the history of chocolate as it pertains to the city, while trying some yummy treats along the way. Tickets start at $50. Back Bay tour starts at 10:15 a.m. The South End tour starts at 2 p.m. This hands-on chocolate workshop teaches you everything you need to know to to make show-stopping truffles filled with anything from champagne cream to chocolate peanut butter. $85. Noon, Elephant & Castle Restaurant at 161 Devonshire St., Boston. Grab the family for a performance of “Stuart Little” tonight at the Wheelock Family Theatre. E.B. White’s classic tale follows Stuart, a mouse born into a New York family, and his many "larger than life" adventures. Tickets are $20-$38. 2 p.m., Wheelock Family Theatre, 180 Riverway, Boston. For more than three decades Duckling Day celebrates Robert McCloskey’s classic children’s book “Make Way for Ducklings.” Join more than 1,000 people who annually meet up and parade through Boston dressed like characters from the story. Registration fee is $35 per family in advance or $40 per family at the event. 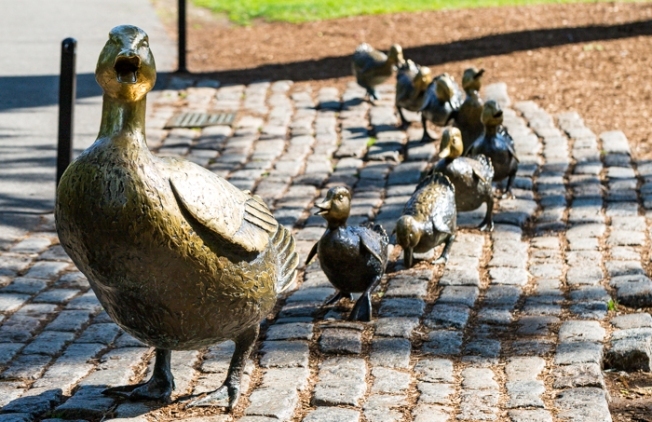 The parade begins on the Boston Common at the Parkman Bandstand and ends in the Public Garden near the famous Make Way for Ducklings sculpture. Registration starts at 10 a.m., parade starts at Noon. Enjoy this annual daylong celebration of the lilac. The lilac collection at the Arnold Arboretum is among the premier collection of the plants in the U.S. Enjoy tours, family activities, picnicking and more. 10 a.m. to 3 p.m., Arnold Arboretum, 125 Arborway, Boston.